For the bride and groom looking to make a grand entrance on their wedding day, a horse drawn carriage is one way to do it. 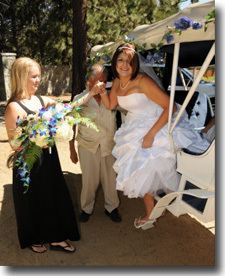 Departing from the main section of town near the casino area, your carriage will carry you through the city like royalty for a romantic jaunt to your destination, a private beach conveniently located in South Lake Tahoe. Your wedding will take place at the water’s edge, a remarkable setting where you and your guests will celebrate a very special day. The wedding area is quite spacious and can accommodate large parties of up to 150 people. 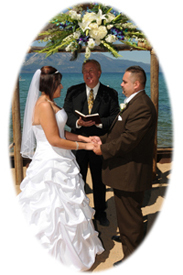 Seating is provided for all attending in addition to a decorative arbor for your ceremony. A staff member of this private resort will greet your guests as they arrive and offer assistance to help ensure a stress-free wedding. As your guests anticipate your horse and carriage arrival, they can relax to the pleasant background music provided and enjoy the scenic panorama. 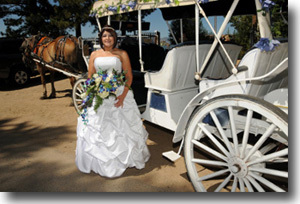 The carriage can accommodate four to six people, so the bride and groom can choose to have elect members of their wedding party, parents, specified guests, or any combination thereof to accompany them on the leisurely stroll across town. 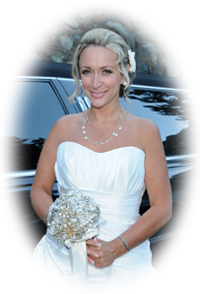 The memorable ride will create a lasting impression and compliment your special day. As an option (for an additional fee), your carriage can await the duration of your beach wedding and then bring you to your chosen reception venue or other selected destination (must be located within approximately 1 mile of the ceremony site). 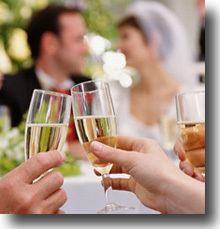 If you find it desirable to have a champagne toast along the way in celebration of your new marriage, feel free to bring your favorite sparkling wine. For the couple who loves the idea of making a grand entrance on their wedding day but prefers an indoor location, the horse drawn carriage can pull you and elect members of your wedding party to a conveniently located and charming chapel. Your carriage will depart from the state line area in South Lake Tahoe and take you for a jaunt through town to your destination. 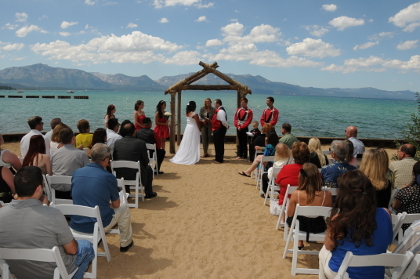 This ceremony venue is ideal for small, intimate weddings. The chapel provides seating for up to 50 guests.